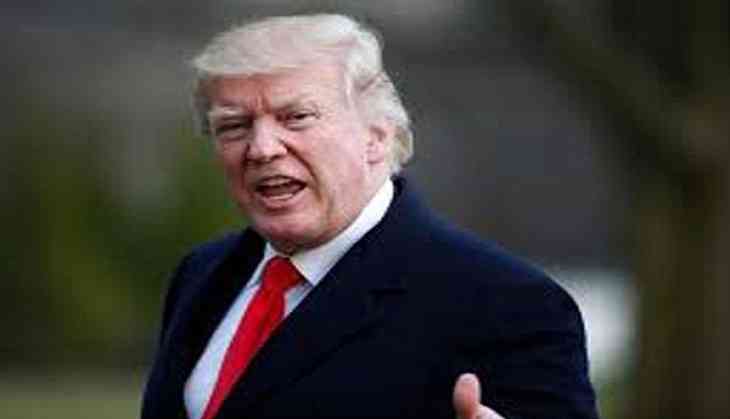 United States President Donald Trump said that the Nunes memo revealed how the Federal Bureau of Investigation (FBI) and Foreign Intelligence Surveillance Court (FISA) were used to influence the presidential elections in 2016. The President quoted Wall Street Journal and alleged that the FBI became a "tool of anti-Trump political actors" and dismissed it be a non-partisan enforcer of the law. In a series of tweets, he said, "The four-page memo released Friday reports the disturbing fact about how the FBI and FISA appear to have been used to influence the 2016 election and its aftermath...The FBI failed to inform the FISA court that the Clinton campaign had funded the dossier....the FBI became...."
"a tool of anti-Trump political actors. This is unacceptable in a democracy and ought to alarm anyone who wants the FBI to be a nonpartisan enforcer of the law....The FBI wasn't straight with Congress, as it hid most of these facts from investigators." Wall Street Journal", he said in another tweet. Earlier on Saturday, the President had also claimed total vindication from the memo released and alleged that the FBI misused its surveillance powers during the probe of Russian meddling in the elections. He also called the investigation "an American disgrace". He tweeted, "This memo totally vindicates "Trump" in the probe. But the Russian Witch Hunt goes on and on. There was no Collusion and there was no Obstruction (the word now used because, after one year of looking endlessly and finding NOTHING, collusion is dead). This is an American disgrace!" The memo also includes information which could complicate Trump and his allies efforts to undermine special counsel Robert Mueller's inquiry, said local reports. The possibility of firing Deputy Attorney General Rod Rosenstein and Special Counsel Robert Mueller also aroused after the release of the memo. An official of the White House on Saturday, however, said that there were no discussions about firing United States Deputy Attorney General Rod Rosenstein. The Democrats, in a letter, said Trump that using the Republican memo as a "pretext" to fire Rosenstein or Special Counsel Robert Mueller would spark a "constitutional crisis". "We write to inform you that we would consider such an unwarranted act as an attempt to obstruct justice in the Russia investigation. Firing Rod Rosenstein, DOJ (Department of Justice) leadership or Bob Mueller could result in a constitutional crisis...," the Democrats said in a letter to the President. White House deputy press secretary Raj Shah said, "I'm saying it on behalf of the White House, and that's that no changes are going to be made at the Department of Justice." "There are no discussions or consideration of firing Rod Rosenstein," the official said to local media. The controversial Nunes memo was released on Friday after Trump gave a green signal to it. "I think it's a disgrace. A lot of people should be ashamed of themselves," Trump said in Oval Office after approving the memo. "It was declassified and let's see what happens," Trump added. In a rare public statement on Wednesday, the FBI had said: "We are gravely concerned that critical facts are missing from the documents and has painted an inaccurate picture of how the bureau sought approval to conduct surveillance in the probe." Russia, however, has denied meddling in the election campaign and Trump has called Mueller's probe a "political witch hunt".